Originating from France, the crepe that is present in most French households is taken one notch higher in restaurants. Due to its thinness, crepe is quick to make and requiring only a gas stove, car t and frying pan; it can be quickly assembled by the table. 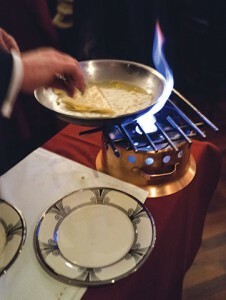 The most common way to do this is to pour liqueur (orange flavour is popular) over the cooked crepe with sugar and butter before igniting it. The alcohol evaporates into a fairly thick and caramelised sauce. 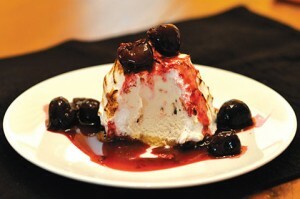 Widely believed to have been created by Auguste Escoffier for one of Queen Victoria’s Jubilee celebrations in 1897, cherries are cooked off in liquer to become a sauce served over vanilla ice-cream. Another fruit flambe dessert is the Banana Foster where bananas are cooked in butter, sugar and rum before fire is set to finish it off. Primarily made of ice-cream, the pie dish is also lined with sponge cake and topped with meringue (whipped egg whites and sugar). After assembly, the dish is placed in a very hot oven for a short time to firm the meringue and give it the ‘baked’ colour. 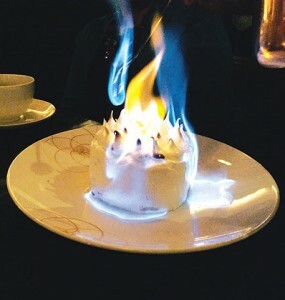 Since only heat is required to cook the meringue, restaurants have turned it into a table side presentation simply by using a blow torch to light it up. 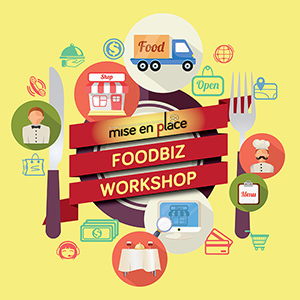 Way back in the 18th century, the Swiss discovered the fun of interacting with food through the cheese fondue. Basically a pot of melted cheese in the middle of the table and diners spend a long evening dipping cubes of bread into it. The idea became so popular in America and it wasn’t long before someone came up with a chocolate version. 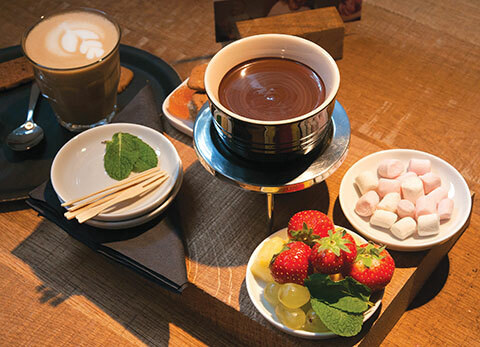 Although not verified, a Chef Konrad Elgi is credited to have developed the chocolate dessert fondue as an avenue to dip fresh and dried fruits, biscuits and marshmallows. Nitrogen in a liquid state at an extremely low temperature causes rapid freezing which has taken it from the science lab to food kitchens. 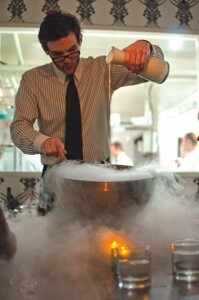 Chefs discovered how they could prepare fresh ice-cream in an instant. The wasps of cool air dispersed makes it a cool show in front of diners or you could even invite them to make their own ice-cream.